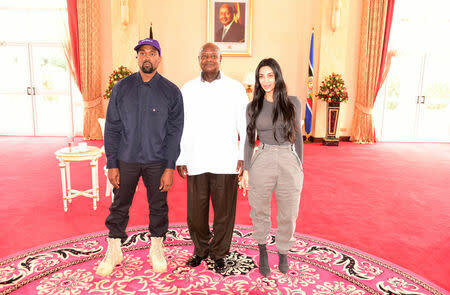 KAMPALA (Reuters) - Kanye West and Kim Kardashian gave Uganda's leader a pair of the rapper's sneakers on Monday and he gave them both "Ugandan" names, at a meeting aimed at promoting tourism in East Africa. Museveni's office said the president gave the U.S. entertainment stars Ugandan names. He dubbed West - who himself declared last month that he wanted to be known as just "Ye" - "Kanyesigye", a common name among the Banyankore, the ethnic group that Museveni hails from. Kardashian was granted the name "Kemigisha", meaning "the one with blessings from God," Museveni's office said in a statement. West "expressed happiness at being in Uganda, describing it as his second home," the statement said, adding that West pledged to put up a "world class tourism school in the country saying it will be a foundation of tourism not only in Uganda but the East Africa region in general."